Batman and crew face Wonder Woman, blazing in evil glory. She tells Batman that she's there to help, not to worry. Her Amazonian spirit is preserved. Batman clocks her a good one and tells the crew to run. Wonder Woman asks how Batman knew she was playing possum, and he tells her that he couldn't help remembering her Greek origins, and the Trojan Horse's place in her culture. Batman and Wonder Woman punch and parry, and eventually, Wonder Woman drops a cliff towards Batman. Kishana and Plastic Man walk on, granted a moment's reprieve by the fact that the monsters are now too big to see them. Kishana is scared, but Plastic Man tells her that Superman AND Batman believe in her, and that means something. Superman and Martian Manhunter lament that the fight may cost Kishana her life.Manhunter tells Superman that he has feelings for Kishana. Kishana and Plastic Man find a white elk...an intense symbol of wisdom. They decide to ride it to make better time. Underneath the lodge, Jade and Flash are about to give in when hotel guests arrive with weaponry and shoot the monsters back. Green Lantern, meanwhile, is having more problems. He is thrown through a wall. Upon rising, the hotel manager slashes him, turning him into one of the mosters. The elk Kishana rides is hit with a spear thrown by Wonder Woman. Plastic Man and Kishana rise as the elk dies, and Wonder Woman attacks. Kishana is able to punch her off, through her hidden power. 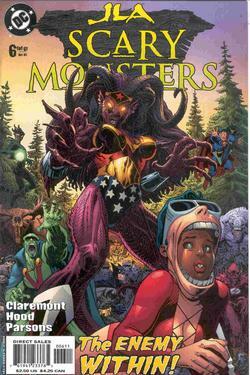 Plastic Man is pulled away by a force of monsters, and Kishana is noosed and pulled towards the lake, and the tower in her head, by unseen forces. The unseen force turns out to be a Plastic Man noose, held by Wonder Woman. Meanwhile, Superman and Manhunter do battle. Manhunter leaves to help Kishana. Kishana is choking when Manhunter descends, grabbing Wonder Woman. Wonder Woman is beating him senseless when he explains that he has already faced annihilation, and understands it. In concert with Kishana, he hits her with his heat vision, and she descends, attacking the monsters at their core. A nuclear blast rises from the Earth, and the monsters, for the moment, are annihilated. All are healed, and Kishana descends, at peace with her legacy and newfound powers. She looks Martian, a temporary result of Martian Manhunter imbuing her with powers, and the two kiss. Martian Manhunter is blown back...there will be no sacrifices today, but Kishana is now fire based, so romance will be touchy, at best. The League thanks her, and she realizes with the hotel manager and other agents of the monsters on Earth, she will have more work ahead of her. Story - 5: All in all, this series is in my top five in the last recent year or so. A good ending to a great series. I couldn't tell you, above, in the summary, about the totems, so I will here. Throughout the book, there was a totem on either side of the page, one representing Wonder Woman and the monsters, and another representing Kishana, and as Kishana fought, they flared, depending on which side was winning. Masterful symbolic storytelling, interspersed with characteristic, typical, fun comic book fare. A new hero. I didn't expect that, and she IS in part, a clich�, but she plays very well off Manhunter, and she has the characteristic of a great Superhero...a desire unfulfilled. Making up for Uncle Ben, compensating for a lost planet, and now, the love of a Manhunter. The monsters were a general villain. The Native American motif was a bit stereotypical. But the writing in between the covers, coupled with a steady pace, a good interaction between known characters that seem new, and we have a great series. Put this man on JLA. He has my vote. Yeah. That sounds about right.and number three is great shakes for a guy who reads about 20 regular periodicals. Art - 5: Give this guy a JLA spot as well. He's got it down to an art. Wonder Woman with Batman's cloak, the totems, Kishana's new look, Batman's fight with Wonder Woman...who could make me believe Batman in a fist fight with Wonder Woman. Few, folks. But given how it was handled, it's obvious in the fight it was less Batman's strength but his strategy. That is dang hard to convey in pencils. Cover Art - 5: Better than the last one, and upholding the quality of the covers overall. Kudos to the colorist especially, because it is very vivid and well done here. Kishana looks cool, and the Wonder Woman is crazy. Usually, I would cut a point for a scene not covered in the issue, and Superman and Manhunter were not in such a scene, nor was Batman, but given the starkness of the cover, along with the crazy, cool nature of it, I'm going to let it slip with just a mention. Oh, and THE ENEMY WITHIN, learn, guys. Words on the cover usually stink. It' s lucky they're hardly noticeable on this one. If you haven't bought this series yet, I highly recommend it in trade paperback if it ever comes out. This is a fun, great series.